Face it, no one really agrees with Diane Court's decision to break it off with Lloyd Dobler in "Say Anything" (1989). This could be because no one wanted Diane to follow her father's advice ever again, or because no one could picture Lloyd going on without Diane -- especially Lloyd. For Lloyd, Diane Court was his first broken heart. His reaction to their split covered the range from tearful misery to acts of pure romantic desperation. 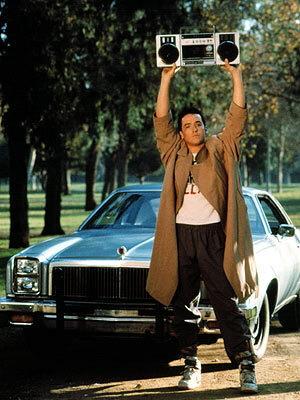 The image of John Cusack (who played Lloyd) holding a boom box over his head has become an iconic symbol -- the image of a guy declaring his devotion to a girl for God and everyone to see. Now, here's the thing. Here's what makes the world root for Lloyd: We've all been there. Male or female, by the time we reach prom or graduation or senior summer, we've had our hearts trounced on, been blind-sided by the whole lets-just-be-friends speech (or voice mail, or text), and felt like the world couldn't possibly continuing turning without that guy or girl holding our hands, holding our hearts. My first broken heart... mercy, but I can still see his face, still hear his laugh, still remember the day he filled my arms with kittens, and still remember the day he said good-bye. He'd enlisted in the Marine Corps before we met, opted for military service rather than college, so I knew all along he'd be leaving. But wow, I never expected him to break up with me the day before he had to report to the local base and head off to boot camp. He didn't think he had a right to ask me to wait for him or some similarly noble and idiotic sentiment. Really, it was all very Diane Court of him. Of course, in time I recovered. I stopped crying myself to sleep, stopped dreaming of what could have been, stopped thinking of things I should (or shouldn't) have done. It took serious effort, but I got through those dark days. Later, there would be other other and other loves and other heartache. But this guy -- he's the one I never got over, the one to this day I'd stand on a lawn and hold a radio over my head for. He wears the heartbreaker crown in my life. Funny, but if it wasn't for him, I wouldn't know how strong I can be, just me on my own. And how much happily-ever-after magic can be wrought with a pen. YOUR TURN! Have you survived your first heartbreak? What made him or her special? :-( That brings a little tear to my eye. I think the cure to overcoming the heartbreak of first love is to discover he's aged really, really badly. Yes, I survived my first heartbreak, but I'll always remember him. He was my first boyfriend, first love, and I simply didn't know how to communicate because the whole thing was brand new to me. So every time I was unhappy, angry, or confused, I broke up with him and held my breath until we'd get back together. That resulted in a lot of tears, let me tell 'ya! I loved Say Anything. Lloyd was the ultimate hero. Not only was his love unwavering but even after learning what her father had done to come between them, he'd tried to console the old man. My first love wasn't nearly as mature as Lloyd, therefore he was much easier to get over. :) Still, I wept when he broke my heart. Today, I thank him for doing so. Every heartbreak puts us on the path to find our true mates. Heartbreak truly is universal, but experiencing it makes those *happily ever afters* that much sweeter! Awesome, Awesome, AWESOME post! Love it. Broken hearts... sigh. I had a few of those. I've always been a writer, so I used my pen to get me through it. Ah, the high school love poetry! LOL. Other than that it was just growing... growing and learning I could do it on my own. I can barely remember my highschool boyfriends. I know I split up with a few and I'm sure I was upset but nothing major that stays with me now. My main heartbreak was my first fiance and I had to split with him as we just weren't going to make it work long term. That was really hard. I have to admit that my first real heartbreak was completely my fault because I was clueless. We were best friends (so I thought) and I ignored all the signs that he saw me as something more. It wasn't until we drifted apart that I realized how much I liked him, too. But by then, he had moved on, and I couldn't blame him. But that didn't stop me from the ache and angst of what might of been, if only I'd been aware enough from the start. Ah, the ache of a broken heart! After what I now know were minor heartbreaks in high school resulting from overactive teenage angst, my first true broken heart came from my first true love. After sobbing my eyes out in my mother's arms, I forever changed my feelings and convictions of the value of trust and honesty. I also discovered the truth of the whole 'door closes but window opens' theory. I met my future husband, the best friend of my heart, a couple weeks later. That was over 20 years ago. @Helen, oh, smokes! I couldn't imagine having to break it off with a fiance. That takes a strong person. Good for you for making the tough the choice. And you bring up a great point: sometimes the first love is not the first heartbreak. But first or fifth, it never gets easier. @Gerb, you poor thing! Not enough to have a heartbreak, it's got to be an unrequited love heartbreak, too? Sending teen-aged you a hug!!! @Tuere your story totally made me swoon and ache all at the same time. amazing! thanks so much for sharing!!! @Ginger I gotta tell you, I've got a little bit of envy going. That's so cool you had your mom there to hold you while you cried. My mother had a habit of handing me tissues and telling me to stop making such a big deal out of nothing : )~ So pleased to know your heartache had a happy ending!! Look at the stories you brought out of people about the loss of their first true love. Oh, Lloyd! I loved that movie SO MUCH. The part where his best friend tells him, "Don't be a guy. The world is full of guys. Be a MAN..." gets gets me every time. As for first heartbreak...ugh. I survived, because that's what one does, but it took a long time. The day I figured out I WOULD survive was a big day, though. Aw, Jen, I've got a lil' tear in my eye over your first heartbreak! It did bring back memories of my first heartbreak...and the one after that...and the one after *that*. There's always a whole lot of pain to work through before you realise life really does go on. Thanks for mentioning one of my all-time favourite movies! I'm penciling in another viewing after I finish my revisions. You're killing me, Jen! But I guess it gives you plenty of compelling emotion to draw from for your stories. Hugs and happy writing! Your post is beautiful, Jen, and it dredged up memories. @Robin, thanks for stopping by and thanks for the kind words! @Erica, yeah, that's a great line! And advice I wish more guys would take ; ) I'm envious you figured out you would survive. I think I never realized that. I think I just hit a point where I realized I did survive. @Shelley, thanks so much for the vote of confidence in my storytelling. This is one of my personal stories that could play a big part in my next book -- fingers crossed! @Pat, thanks so much for reading and leaving such kind words. Thank you! Gah! What happened to my post? It's not here! Ugh, I'll have to reconstruct it (if I can). Jen, I LOVED this post, so heart wrenching. I can't imagine how crushed you were! Thankfully I don't remember ever being this devastated by a guy. I'm not saying it didn't happen, I've probably just blocked it out to protect myself! Anyway, you got through it and learned how strong you really are!